. . .ir reading exercises, walking to their teacher with bare feet in the cold of winter; they frequently—once or twice a month, as on the festival of a god of learning,—came together in small groups and passed the night without sleep, in reading aloud by turns. Pilgrimages to all sorts of uncanny places—to execution grounds, to graveyards, to houses reputed to be haunted, were favorite pastimes of the young. In the days when decapitation was public, not only were small boys sent to witness the ghastly scene, but they were made to visit alone the place in the darkness of night and there to leave a mark of their visit on the trunkless head. What an interesting little book! As many of my Goodreads friends know, I have a keen interest in Japan, although I've never really read into its' history or the philosophical foundations on which it developed, at least to be what it was prior to significant Western influence. It was a very interesting book, I really enjoyed exploring the samurai ways of living, I highly recommend it . 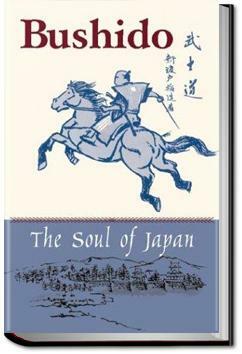 I recommend this book to all who want to understand the character of the Japanese people. The author was the best known author in the west in his time. He melds the phylosophies of the east with the phylosophies of the west going back to the Romans and the Greeks. When men's fowls and dogs are lost, they know to seek for them again, but they lose their mind and do not know to seek for it.